It is often said that looking for a job is itself a full-time job. As it is with any job, your days should be planned out, and your valuable time used efficiently to achieve your professional goals. Many job-seekers struggle with this concept. Exactly how should they spend their time? Which activities should be given priority, and which ones minimized? Too many job-seekers spend the majority of their precious time searching for and responding to internet job postings. The truth is that this is one of the least productive uses of your time, and has an extremely low success rate. Online job boards are merely an updated version of the old classified ads in the newspaper, which are even less likely to get you anywhere in today’s internet-centric world. Most online submissions go totally unanswered. Those résumés, cover letters and applications that you’ve labored over usually go into the proverbial “Black Hole of HR.” That’s why savvy job searchers do not rely on simply applying to online job postings, but rather spend most of their time networking, finding ways to go around HR, and talking with actual decision-makers at their target companies. Oh sure, every once in a while responding to an online job posting scores someone an interview, or in some cases even an actual job. It does happen … albeit infrequently. So I’m not suggesting that you totally ignore this method of job searching. Simply limit the time you spend on it to around 10%. Sending your unsolicited résumé and cover letter to companies where you have no networking contacts, and there is no job being advertised is a very “old school” way of job searching. It is extremely unlikely to produce results in today’s challenging, candidate-flooded job market. It is the job-seeking equivalent of a salesperson’s “cold call.” There are certainly better ways to spend your time! Of course, there are occasional exceptions to this from people who beat the odds. I recently heard a story of someone who wrote a letter directly to the president of a company he was targeting expressing his interest … and he actually received a response back from that president asking him to call him. Again, I’m not saying that you should never do this – just minimize the time you spend on it to 5% or less. SO – the overall message here should be very clear. 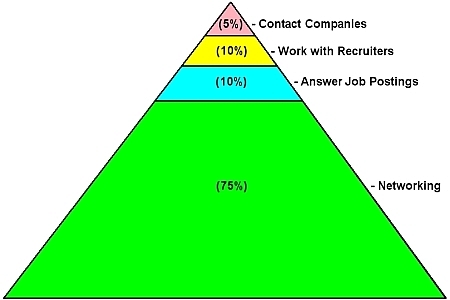 Use this Job-Seeking Pyramid to plan your time efficiently. By all means, use a multi-pronged approach … however, concentrate on those activities that are proven to be the most likely to produce results (i.e. networking!) and minimize the activities that are less likely to be successful. Make sure you are maintaining a healthy, well-balanced job search. Stay positive, and keep plugging away! Face-to-Face Interviews: Secrets, Tricks and Tips	Getting Un-Stuck from your Rut! Excellent work, Michael. As usual. It is very useful article. Excellent work, Michael. Thanks a lot. Keep up your good work. Michael, this is a wonderful article. I love the pyramid, very easy to follow. I will share with my students. Networking is truly what it is all about, teaching people how to network is the challenge. Thank you Michael, nice article how to prioritize, focus and balance your job searching time. I find networking, in higher education to be helpful, to get background information about an institution. But with posted positions and search committees, do you feel that networking has the same benefit as in other industries? I’m no expert on jobs in higher education, but I can certainly imagine the challenges one would face in that area regarding search committees, internal politics, etc. Still, I would like to believe that networking your way to decision-makers in any organization or institution can only help you in the long run. It certainly can’t hurt! I stumbled upon your blog and found it extremely helpful – especially the tips on networking. What I liked the most about your articles/tips is that you hold people’s hands and walk them through the process and don’t assume that people know things. Social networking is especially a new concept and many people don’t know how to use it to their advantage. I am one of them. I truly believe that no one has ever thought about the novices treading the waters. You seemed to be in the minds of these people and answered all the questions that they could possibly have. Fantastic job!! I am in transition. This is the first time in my life that I am looking for a job and I am overwhelmed by the process. Your articles put my mind at ease and I was pleasantly surprised that there are people out there who are actually helping people without any fee. Thank you again for doing such a wonderful job. God Bless! I enjoyed your article, especially the pyramid. This is my first time being without a job and it has been a slightly daunting experience and has left me uncertain. For those of us that are still novices in the networking department, it does take a lot of work and patience. Thanks for the guide and for being realistic and professional. I recently came across your blog and find it very informative and well thought out. I work in the University of Missouri-St. Louis Career Services office, and would love to share this with our students! I know this could really benefit them as you explain your thoughts very clearly and the pyramid diagram is a wonderful way to explain it for the visual learners we work with. Thank you for your time, and thank you for sharing your insights! I look forward to reading more of your posts in the future! Great article with insight. Thanks. Excellent. I hope it will help job seekers like me. Great discussion. Useful tips. Thank you! I am in full agreement with you that AGE discrimination exists in the corporate world and really there are some unfortunate people in this world who have either suffered or going to suffer in future. I personally feel that constitution of each and every organization, big or small is very sacred and people loving, but persons at the helm of affairs make it bad with the result some people suffer. I just want to share my personal experience in this regard with you Sir to lesson my burden on mind which i am carrying till date. I worked under a boss [Mr. R.B.Singh] for 3-years [2006—2009], and had a very humiliating and unfortunate experience. As a matter of facts, all the times he was after me, harassing me ,insulting me before my colleagues in the meetings.and never left any chance to disturb my mental balance. Even he started fudging my reports,putting false blames, withholding my expenses reimbursements for months together,and year after year spoiling my annual reports [Appraisals].and encouraged Insubordination in my area, with the result people got undue advantage and enjoyed at the cost of company. Even this was well in the knowledge of seniors and HR. MANAGER Delhi Branch. Since I was at the fag end of my career with just 3.5 years to retire from the services, I was just helpless and was having sleepless nights. in June 2009 I was asked to take premature retirement. I am just without a job, sitting idle and worried at the moment. I am trying my best to get a job, as i have a great urge to work, but perhaps my age factor is a hurdle for me, or the right opportunity is yet to come. Many boomers lived through the evolution of computers and were too busy living to keep their skills up to date. Esp if they have been in one company for most of their career –or at least since they turned 40 (10+ years ago – which is common). They know the systems of their old job, but not much else. And now that job is gone ~The best thing any boomer can do to stay competitive is to keep computer skills current. (and if you are reading this, you are obviously current-I was at a job search class last week and the moderator didn’t know what “linked in” was~). The next best thing is to build a network that extends beyond their generation. Volunteer, make friends online. It used to be that you could work for companies that were not so computer savvy, or were dominated by older workers (i.e.,government, hospitals, insurance, manufacturing) – and companies that were not image-conscious (forget marketing, retail, any place where your old face fights the younger image the company wants). But many of these places have hiring freezes. And even if they don’t, younger labor is often cheaper labor and willing to put in long hours to advance. Another good article Michael. I’m glad I found you as you have very good insight and it will help me in my job search.